Prominent & Leading Manufacturer from Mumbai, we offer brush cutter blades. WE ARE ONE OF THE LEADING MANUFACTURERS OF GRASS CUTTER BLADES. THEY ARE MADE OUT OF HIGH QUALITY CARBON STEEL STRIPS DULY HARDENED AND TEMPERED WITH EXCELLENT FINISH AND PACKAGING. 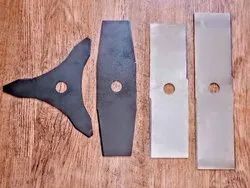 Looking for Brush Cutter Blades ?